The Moon House. Come mingle with the stars. The Moon House is situated off of Highway 133 on one of the oldest Orchards in the Valley (the Linman homestead est. 1910). The Moon House is the perfect getaway for travelers that look for a little more space, elegance, and amenities. Relax, unwind, and enjoy the views of the West Elks and the night sky on the covered porch with fire pit. The house telescope lets you explore the galaxy and the soaking tub is a perfect nightcap to your hikes and wine tours. Bring your kids and pets for an unforgettable family adventure. Book now and make sure to message me to guarantee your reservation!The 3 acres allow enough set- back from the highway and the neighbors (Pitt Construction and Thistle Whistle Farms) to enjoy a peaceful fire with on the deck. Park up to 6 cars in your private driveway. You are free to roam and pick your bounty from the 7 Red Delicious apple trees right outside your bedroom window. The entrance has 6 stairs with railings on the front deck. The Master bedroom is complete with a memory foam king bed and reading nook. The Master 5 piece bath has a separate shower and soaking tub with bath salts and bubbles. Each of the other bedrooms have comfy queen beds with Smart TV's loaded with Netflix, Roku, Sling, and a plethora of other channels. Each room has its own LED Moon light with different setting that can be operated with a touch of a finger. There is WiFi throughout the house and yard so you can handle your emails anywhere on the property. A backyard (50'x100') is fully fenced for a private sanctuary for your furry friends or a private space to throw the frisbee. Pets are allowed with prior approval and pet deposit. We are a cannabis friendly place but ask that you do not smoke inside. Access with personalized key code. We are happy to leave you in peace or be your information guide to this amazing valley. Guests are welcome to access any part of the "Moon House" with a fully equipped kitchen (pots, pans, blender, toaster, dishwasher, and microwave oven are all there to cook a feast for your family and friends). If you'd rather cook and eat outside, the gas grille and fire pit table are all yours to use too! 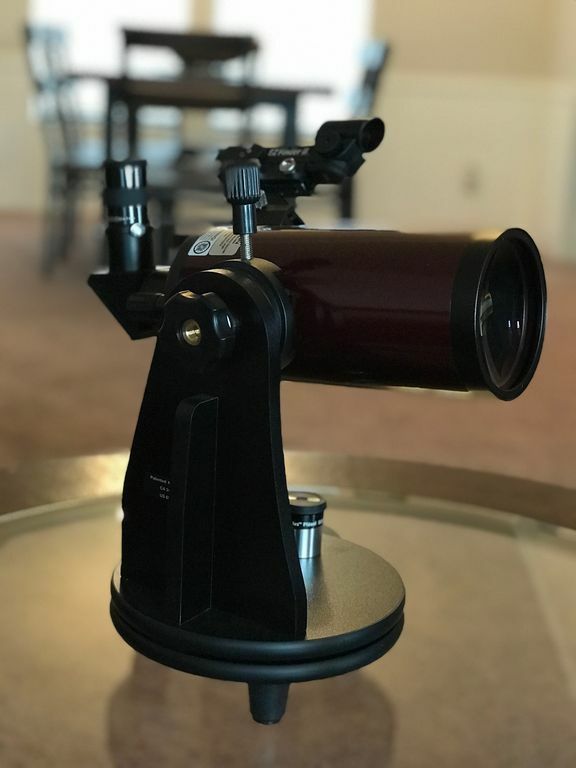 The house telescope is easy to move, maneuver, and use to soak up the night's sky. The Moon House's fully fenced backyard is there to keep your furry friends safe and secure. You are free to pick as many apples that you'd like from the 7 apple trees on the property. The one car garage with automatic opener is perfect for protecting your vehicle or outdoor gear. Alexa, a Smart Speaker, is fully loaded with any song or album request you may have. The breakfast nook is outfitted with Cards Against Humanity, puzzles, "Shoot the Moon", and playing cards. All smart TV's are loaded with Netflix, Hulu, Swing, HGTV and a plethora of other movie, music, and kid's channels. The laundry room and detergent and softener is all yours to use so you don't have to go back home with a bag of dirty clothes. A high chair and Pack-n-Play are on site so you don't have to worry to pack these for your little ones. Hotchkiss, Paonia, and Crawford are all designated as the "North Fork Valley Creative District." You'll find art galleries, wineries, and Colorado's largest Organic Farm region within a short drive of the Moon House. Delicious orchards (8 mins away) offers local wine and cider along with live music and local produce. PJ's Pub, Pat's Bar and Grille, Tucker's, and the Saddleback are a 1 minute drive away for nightlife. Zack's BBQ, 133 BGR, The Taco Hut, Coal Train Coffee are also a 1 minute drive for dining out. The Cirque, Louie's Pizza, Edesia Kitchen, Flying Fork, and The Living Farm in Paonia is just 10 minutes away. Take a short trip to Crawford resevoir (20 mins) for a swim with the family. Looking to catch the "Big One?" Grand Mesa with over 300 lakes or the Gold Medal waters of the Gunnison River are at your fingertips. Take the West Elk Scenic Byway for a day adventure and tour Crested Butte, Gunnison, Paonia, Crawford, Montrose, Delta, and Olathe (don't forget to pick up some sweet corn). Take a hike around Needle Rock (15 mins), know as a very sacred site to the Monk's and indigenous tribes that once roamed here. Eagle rock trail is 15 minutes away for an easy hike with the family to see one of the oldest shelters in the United States. Your adventure awaits so book now! I am a Colorado native that grew up in the Sangre De Cristo Mountains. I am married to my best friend, Carissa, and we now have a wonderful son named Robert (who is also my best fishing buddy). I grew up fishing, hunting, and camping and absolutely love any adventure that involves the outdoors. My wife, brother, and I own and operate a craft brewery and also know how to make wine. The North Fork Valley and Grand Mesa have held a special place in my heart since my youth and now my family gets to live and grow in this spectacular setting. I like to read and make it a point to continue to learn every single day. I love meeting new people and sharing adventures and can't wait to introduce myself you you! Detergent and softner for your use. 1 car detached garage for your vehicle and gear. Private driveway that can park up to 6 cars. 1 car detached garage separated from house by covered breezeway. Spacious living room with electric fireplace, 2 couches, side tables, coffee table, 50" Smart TV, books, games, and extra blankets to keep the whole family comfortable. Stocked with fresh water and condiments. Large fridge for all of your farm and fruit stand shopping trips. Fully Equipped Kitchen with all the pots, pans, bakeware, toaster, microwave oven, electric stove top and oven, dishwasher, spices, and condiments to make a feast for your family and friends. Smart TV's in all bedrooms and living room loaded with Netflix, Hulu, Sling, HGTV, and multiple other travel and channels for the kids. Alexa smart speaker loaded with Amazon music- It's like your own juke box with voice commands and every musician and album you could imagine. Books about food, wine, beer, travel, fiction, and philosophy are all there for your reading pleasure. Cards against humanity, puzzle, playing cards, "Shoot the Moon" are all their for your entertainment. Alexa Smart Speaker- It's like your own jukebox with voice commands and every musician and album you could imagine. View Mount Lamborn and Land's End Peaks from the front deck. Deck with gas fire pit, side tables, and grille. House has 6 steps on front deck to enter. Feel right at home in the Moon House!! We were really happy with the Moon House on our quick (3 day) vacation in the Gunnison Valley! The house is very clean and beds are more than comfortable. The house is 5 minutes out of town on a ridge providing views of the valley. It is an less than an hour from Grand Mesa and the Black Canyon of the Gunnison River. Its just over an hour to the San Juan mountains. Aspen and Snowmass are back to the east less than a 2 hour drive. A great central location to go and explore in all directions then come back relax around the fire pit and get ready for another day of exploring. We also left a couple of items at the house and Chad had them in the mail to us before we arrived back home. Thank you so much for the thoughtful review. We're so happy you enjoyed your stay at the Moon House; It truly is in the center of some pretty amazing adventures! We hope you come back and stay with us again soon! Clean and very comfortable accommodations. The owners, Chad and Carissa have made their property user friendly with an attention to detail. They are available when needed and unobtrusive to their guests. The bottle of local wine and gourmet coffee were much appreciated. Thank you! Good place at a fine price! We were there for three nights with other family members, going to a wedding in Hotchkiss. The beds were comfortable. The temperature control worked well. We didn’t spend much time in the house, due to the wedding-related activities, so we never met the good owners, but appreciated the bottle of wine they left for us. Very convenient spot to check out the Black Canyon of the Gunnison Park, the Kebler Pass drive in the West Elk Mtns, and PJ’s elk venison lasagna! We’d definitely stay there again. We’d just recommend more glassware, and a light thermal blanket option for the warm night’s. Great experience, quiet, clean, comfortable, great location! So pleasantly surprised by everything this rental offered. The home has been updated throughout and it is so bright and welcoming. We were able to open a couple of windows and enjoyed the cool mountain air while sleeping to the sound of crickets. It was quieter than I expected with no road noise, which made me very happy. We watched the sunset, sunrise, the moon and stars, and were lucky to see a double rainbow out the window while fixing dinner. Just made it more magical. We had everything we needed to cook our meals and were very happy to find recommendations and instructions for everything in the house. A local market nearby offered all the fresh produce and local meats that we wanted. The location is great for day trips to the Black Canyon of the Gunnison and the Grand Mesa. We just wish that we had longer than 3 nights to experience more of what this area has to offer.